E-Mail News – Sign Up Now! • Be the first to know about ‘on sale’ dates for tickets for New Shows. • Receive Special Ticket Offers, Weekly What’s On Updates and the Caird Hall Brochure straight to your inbox. Send an email to dundeebox@leisureandculturedundee.com including your Name, Home Address and Email Address. 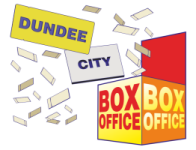 Data Protection Act 1998 : Your personal data is held in the strictest confidence by Dundee City Box Office, Leisure and Culture Dundee, and is processed for the purposes of our email list. Your data will not be passed onto any third party without your prior consent.